Although we all probably have a favorite food, one that most of us would agree can be delicious is a sandwich. After all, they can be made in so many different ways and when they are made properly, they have the ability to make you drool. Perhaps that is how you would feel if you stop by Elsie’s, a sandwich shop in Haddon Township, New Jersey. What they have done is to replace the bread on the sandwich with pickles and you have to taste it to believe it. 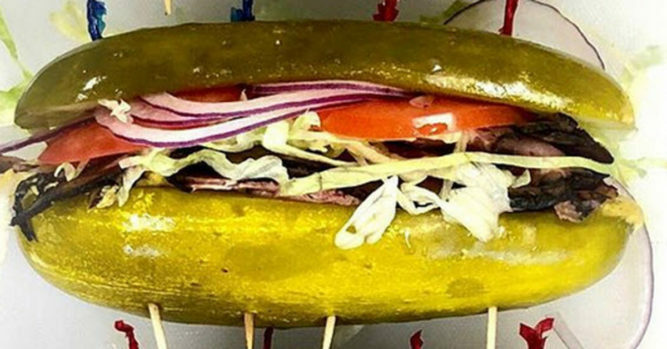 The store is now well known for serving up these pickle sandwiches. One of the popular sandwiches is the Homage Jo Katz Roll, which is made with roast turkey breast, corned beef, Swiss cheese, homemade coleslaw and Russian dressing. The Haddon Roll is also a popular choice. It is made from roasted turkey, lettuce, tomato, red onions and sweet peppers. That isn’t even to mention their build your own sandwich choice. I guess we have to head over and try it for ourselves!